The FBI's Most Wanted (Composer): Leonard Bernstein's "Mass"
Leonard Bernstein at a press reception at the Savoy Hotel, 1972. Photo credit: Associated Press. In celebration of Leonard Bernstein’s 100th Birthday, Bernstein100Austin is presenting his musical-theatre masterpiece Mass this June 29 & 30 at the Long Center. The show will feature over 300 performers from The Austin Symphony Orchestra, Ballet Austin, Austin Children’s Choir, Chorus Austin, and many more local ensembles, all conducted by Peter Bay. Leonard Bernstein’s Mass is a lot of things: eclectic, messy, beautiful, and apparently, a threat to American society — or at least that’s what the Nixon administration thought. Mass was commissioned by former First Lady Jacqueline Kennedy Onassis, whose family and late husband were close friends of Bernstein. It premiered on September 8, 1971, at the opening of the long-awaited John F. Kennedy Center for the Performing Arts. On such an auspicious occasion, then-President Nixon was expected to attend, which was what concerned the Federal Bureau of Investigation. Behind the scenes, the FBI heard a rumor that the world renowned composer-conductor Leonard Bernstein was orchestrating a plot to publicly undermine the President of the United States via Mass’ high-profile premiere. 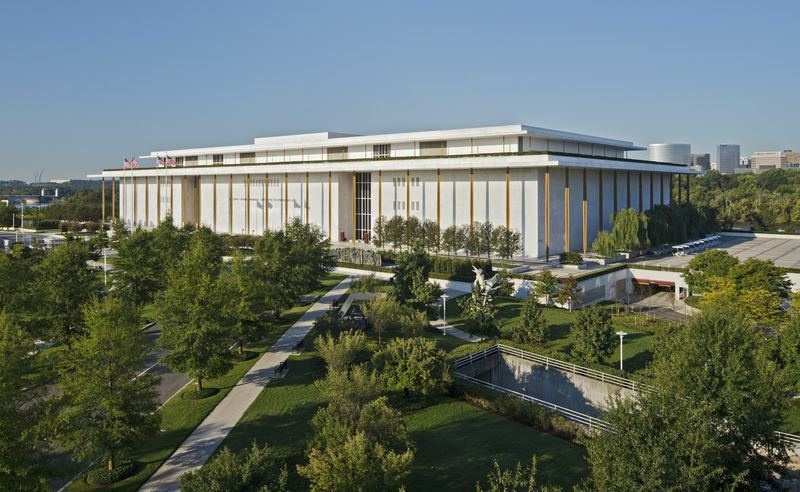 Originally planned as the The National Culture Center, the still-under-construction venue was renamed after President Kennedy soon after his assassination in 1963. Photo credit: Ron Blunt. The FBI’s file on Bernstein started as far back as the mid-1940s. During the Red Scare, the maestro was one of many American citizens under investigation for suspicion of communist sympathies. In 1951, Bernstein was spied on by an informant during a ship ride from Europe to the U.S.
Bernstein’s mutually resentful relationship with President Nixon set off red flags for the FBI as well. This can be traced back as early as April 1958, when the New York Philharmonic and then-Vice President Nixon crossed paths while touring South America. Over dinner in Ecuador, Bernstein gloated to Nixon about the success of his diplomatic mission. In letters he wrote to friends, Bernstein emphasized the contrast of the two trips: that Nixon’s mission was pitiful and that the Vice-President was a “pobrecito” (“poor thing”). Considering this past encounter, the FBI took the rumors about Mass at face value and cracked open Bernstein’s file in the months leading up to its premiere. The investigation was passed on to Nixon’s administration, where it landed in the hands of Nixon’s “Plumbers” — a task force assembled by the White House to stop information leaks which later gained notoriety for activities uncovered during the Watergate investigation. The documents pertaining to Bernstein reflected the growing paranoia of the Nixon administration. Their top concern was that the Latin text for Mass included anti-government messages. Special Assistant to the President Patrick J. Buchanan thought that the administration should find “a good Jesuit” to translate the piece. He also suggested, on an official government document, that they steal a copy of the libretto and, if it turned out to be scandalous, sabotage Bernstein. 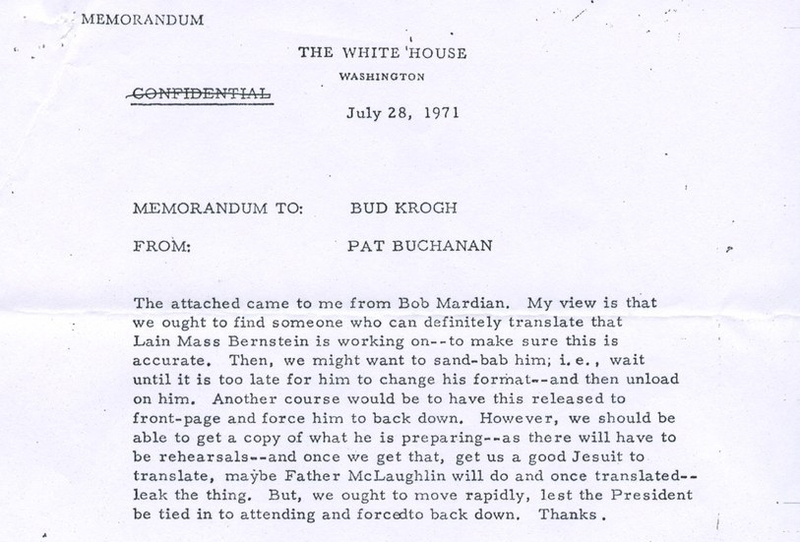 An internal document from Pat Buchanan to Bud Krogh with plans on what to do about Bernstein's Mass. Photo credit: The New Yorker. Despite all the conjecture, Nixon’s “Plumbers” never found any evidence of Bernstein’s master plan. Mass, though certainly a call for peace during wartime, was in no way the anti-Nixon extravaganza that it was rumored to be. However, Nixon still didn’t attend the premiere. Thankfully, the exact reasons why were documented in the now-infamous Nixon Tapes. At the time, it appeared that Nixon didn’t know about the discussions members of administration were having leading up to Mass. This would explain why he sounded surprised to hear that Bernstein would be opening the Kennedy Center in an August 9, 1971 recording. On the tape, Nixon’s Chief of Staff, H. R. Haldeman, delicately told the President, “The reason you should not go to the [premiere] is that what it is — is this Mass written by Leonard Bernstein.” Haldeman went on to describe the piece as “very depressing” and “a sort of everything’s gone wrong kind of thing,” something that they agree is inappropriate for a president to attend. They convinced Nixon that he didn't want to steal the spotlight from Jacqueline Kennedy Onassis on “her night,” and it was decided that the President would attend a National Symphony Orchestra performance on the second night of the Kennedy Center opening instead. Per Haldeman’s suggestion, Nixon also yielded the President’s box seat to Onassis—who didn’t end up attending the premiere either. 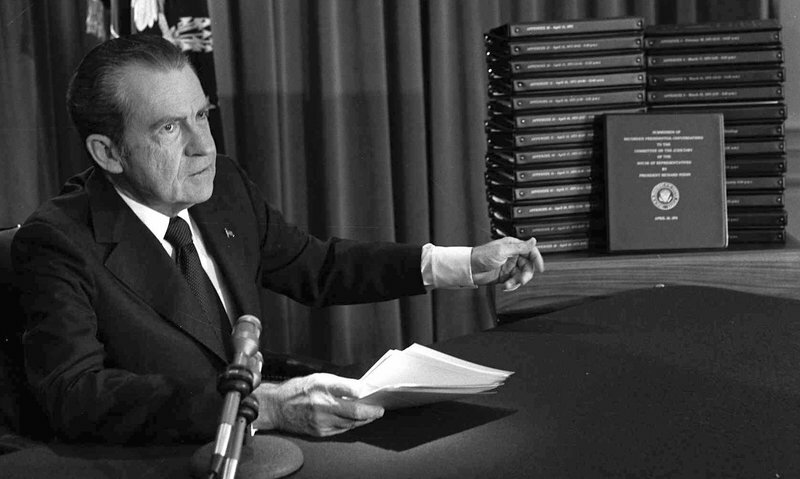 President Richard Nixon on April 29, 1974, after he announced that he would turn over transcripts of the White House tapes to House impeachment investigators. Photo credit: Associated Press. And really, Nixon was right. Mass is a chaotic stew of influences, but that’s also what makes it Bernstein’s masterpiece. The piece encapsulates Bernstein’s life-long creed of unabashedly loving music, no matter what genre it was, where it came from, or who played it. This is also what makes Mass so political, even without a secret anti-Nixon code. It’s American culture distilled into a piece that’s free of musical prejudice: the blues, theatre, jazz, classical — Mass exemplifies the beauty that all types of music can deliver, and how they can come together, no matter how strange it may sound. For a deeper dive into the Nixon/FBI/Bernstein saga, read Alex Ross’ amazing 2009 New Yorker piece here. You can also check out Barry Seldes’ book “Leonard Bernstein: The Political Life of an American Musician” for even more juicy details.